In college, my absolute favorite Friday morning breakfast (ahem, Thirsty Thursday anyone?) was a giant everything bagel, light cream cheese (watching the figure of course), and an iced coffee. The combination was crusty and warm and crunchy and chewy and creamy and cold. Love. Last week, Bruegger’s, a national bagel and bakery chain with many posts in and around Pittsburgh, contacted me regarding some new happenings at their stores. 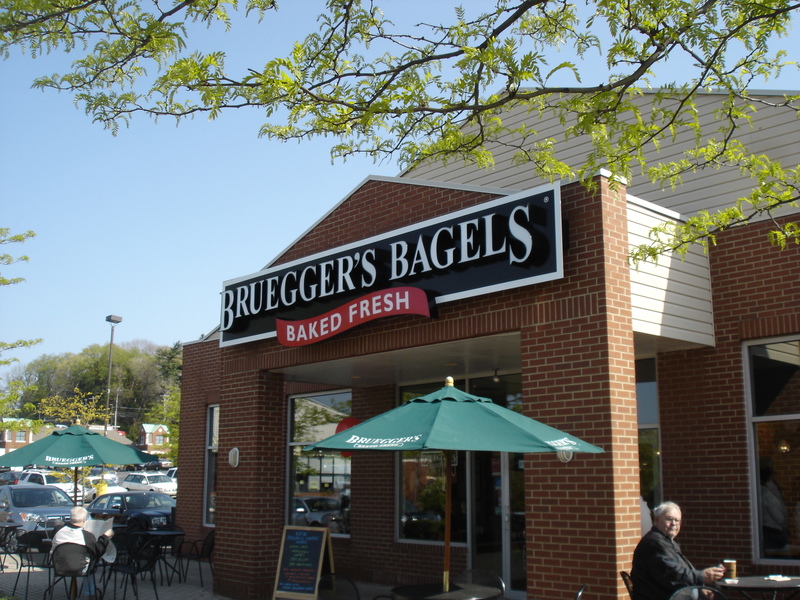 I was not eating Bruegger’s bagels during my Friday morning carb-fests in college, but I have visited many of their locations over the years. Bruegger’s is beginning a massive re-haul of many of their bakeries and invited me to come and check out the very first revamped store in Coraopolis (1134 Thorn Road Extension). Bruegger’s had a nice little set up happening the day I visited. Chef Philip Smith (who recently appeared on the Food Network – cool!) 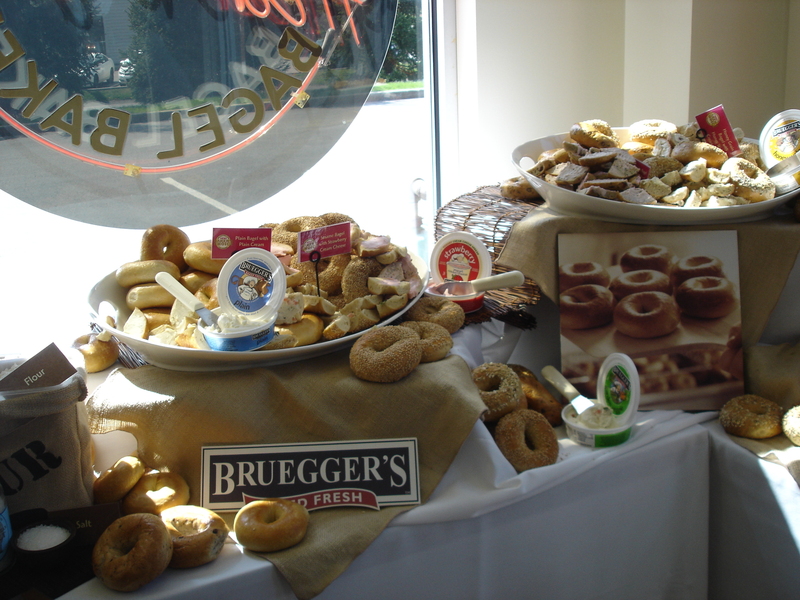 gave a short presentation on the boil and bake method Bruegger’s uses for all its bagels. This results in a bagel with a thin crispy shell-like exterior and a dense and chewy interior. 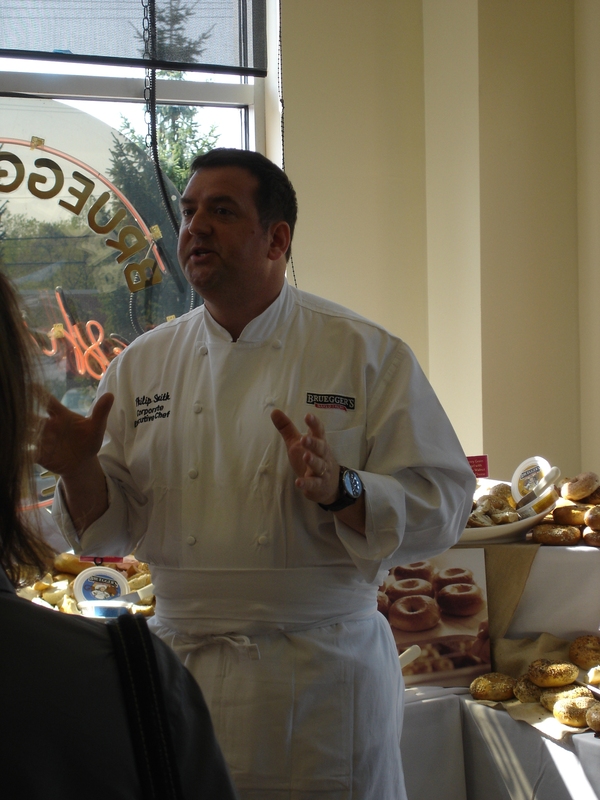 Chef Smith called the bagels “contemplative”. Deep. Samples of bagels and cream cheese were offered. Bruegger’s has its own line of cream cheeses made for them by an outside provider. I had no idea they offered a scallion and bacon cream cheese. That was good stuff. Bruegger’s also bakes all their own breads, cookies, brownies, etc. The new bakery layout included some updated display areas to better showcase these baked goods. The updated store also includes a large window that allows customers to peer into the boiling and baking area. There were many locals enjoying the store on the day I visited. 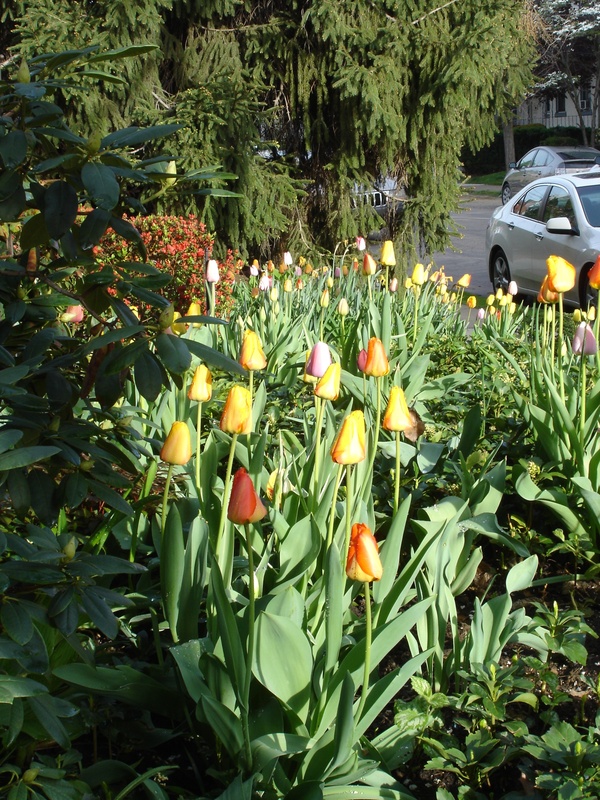 Patrons were sitting around an abundance of outdoor patio tables and cozied up in booths. While at the event, I also sampled a new iced coffee drink the chain is rolling out. It was pretty standard iced coffee but a nice addition to the Bruegger’s menu. The bakeries also do salads, wraps, and the like. I briefly spoke to Chef Smith and it was evident he is passionate about bread and the authenticity of the product Bruegger’s puts out. He truly believes in the backbone of the chain – its New York style bagels. I am by no means any type of food professional here at Snickie, but it was fun to be invited to this event. 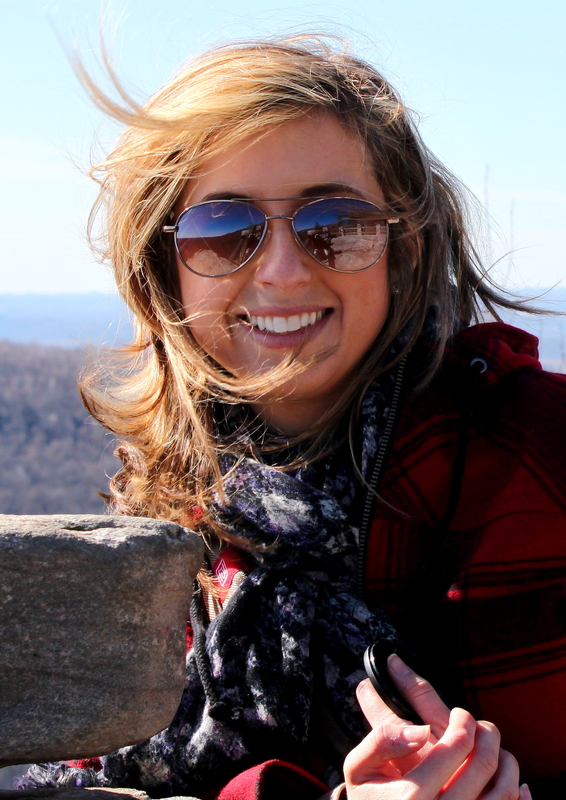 It also made me realize I do appreciate a good bagel. Remember when I tried to make my own? I must say Bruegger’s does a much much much better job. On a final note, during the week of April 26th through May 2nd, Bruegger’s will be donating $1.00 for every bagel dozen sold to Children’s Hospital. All the more reason to get your chew on :). Toast for breakfast today. One and a half pieces of whole wheat sourdough from Trader Joe’s with an assortment of toppings. Let’s discuss. 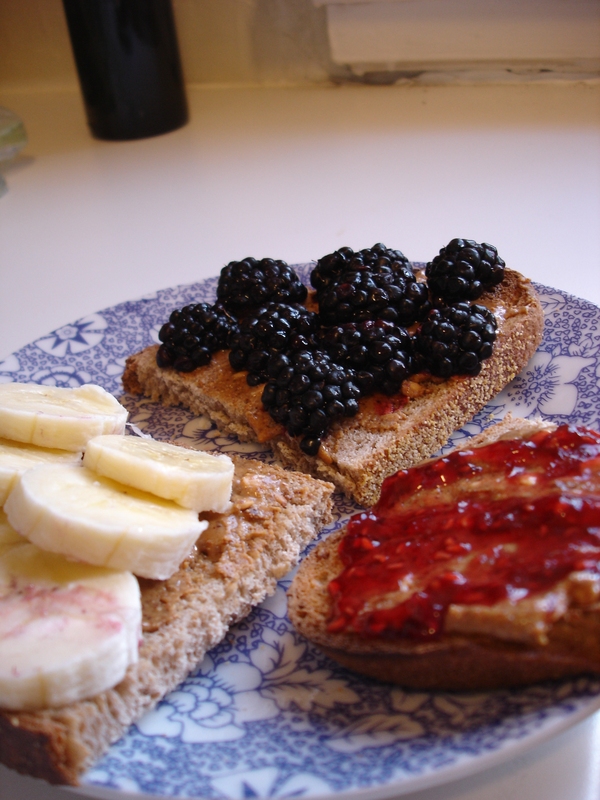 Blackberries and roasted almond butter – Bitttteerrr. These blackberries were nowhere near ripe. Sad. Stan’s let me down with these. Raspberry jam and roasted almond butter – Lovely. Raspberry jam is my favorite. The one I used this morning was also from Trader Joe’s. I love the seeds. Banana and roasted almond butter – Classic. I vaguely remember only discovering the peanut butter (or almond butter) and banana holy grail combo in college. Mom of Snickie, what is up with that? After my toast, it was time for a shower and a walk to the East Busway. Did you know they are re-paving the East Busway? This had better not compromise my six minute commute. Tax season is over. Sort of. Yay! Kale chips – I finally made kale chips and they were way better than I thought they were going to be. I used a large bunch of kale purchased at Stan’s in the Strip. I washed and dried it, cut out the rough stems, and tore it into manageable pieces. I loaded up a half sheet pan and drizzled it with about 1-2 teaspoons of olive oil and sprinkled on about 1 teaspoon of sea salt and a good tablespoon of finely grated parm. I got my hands in there a bit and made sure everything was coated. After the pan spent ten minutes in a 350ish oven, I had crispy, salty, earthy kale chips. I literally ate almost the whole tray within a few hours. Maybe I am becoming a crazy food hippie but I really liked these. Pesto – You can’t beat the $1.50 big bunches of basil you can get at Stan’s Market (1809 Penn Ave – Strip). Pop over to Penn Mac and grab some grated parm and pine nuts and you are set. The other night I threw the basil, a bit of leftover cilantro, pine nuts, parm, garlic, olive oil, and salt into my mini food processor. Yum. Tastes like summer! I ate this over pasta one night and over a big bowl of diced fresh tomatoes another night. The plum tomatoes I got at (you guessed it) Stan’s were not bad at all. Green Smoothie – I have been crushing this smoothie combo over the last few weeks: 1/2 banana (preferably frozen), 1/2 – 1 cup vanilla soy milk, 2 -3 cups loosely packed spinach, a few ice cubes. Blend and enjoy, adjusting the amount of liquid as you see fit. It sounds kind of crazy but its really refreshing and gets lots of greens into you. I will often enjoy this smoothie and a piece of toast with almond butter for breakfast. Maybe I really am turning into a crazy food hippie.